Lake Como, Lake Maggiore and Lake Garda emit their unique sparkle onto the magnificent surrounding landscape, and attract diverse tourists to their banks. Younger travellers enjoy the sailing and nightlife experience of Lake Garda, Maggiore provides a tranquil, relaxed respite and can be enjoyed from the comforts of its surrounding luxury hotels, while sophisticates from Milan are drawn to the magnetism of Lake Como. Lake Como (known locally as Lago Di Como) is framed by craggy backdrops, and magnificent villas festooned with bougainvillea perch on its banks. Three long lakes converge to form Lake Como, joining in the Centro Lago area with the four towns of Bellaggio, Tremezzo, Menaggio and Varenna. These can be visited via the boats and buses connecting the towns. Cultural areas of interest include Como's duomo, the former communal palace, the Broletto, and the Church of San Fedele. Scenic vistas can be explored from a funicolare to Brunate. Hiking trails lead off from here with overnight accommodation en route in the form of baite (modest guesthouses). Across the lake is the Tempio Voltiano, a memorial museum devoted to Alessandro Volta, the inventor of the battery. There is an outdoor market in Como every Tuesday and Thursday morning and the whole day on Sunday. Lake Garda (known locally as Lago di Garda) is the most popular of Italy's northern lakes and has a temperate climate to complement its magnificent setting. The lake towns of Riva, Gardone Riviera and Sirmione can be reached via buses, hydrofoils and ferries from Desenzano. The town of Sirmione boasts the relics of Roman civilisation and a magnificent medieval castle. The Sirmione Spa, the largest privately owned thermal treatment centre in Italy, offers invigorating therapy from its sulphurous waters. Gardone Riviera was once the playground of the rich and famous and is now the recreational haunt for many a tourist. The hills beyond Gardone are perfect for walking and enjoying the scents of nature bursting from the lemon groves. The alpine cliffs are a perfect spot from which to hike, mountain bike and windsurf. The picturesque pebble beaches provide a slower, languid soaking-up-the-sun holiday experience. Lake Maggiore is the preferred holiday destination of the elite. The resort town of Stresa is a haven for Italians, French and Germans who flock to its cobbled streets to enjoy the spectacular mountain and lake views. 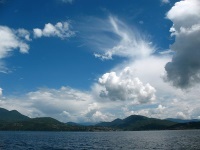 Just a heartbeat away from Lake Maggiore lie the splendid Borromean Isles. Daily excursion tickets enable adventurous travellers to hop between the islands at their leisure. Of these isles, the Isola Bella is the most visited. Its claim to fame is the magnificent Baroque palace, the Palazzo e Giardini Borromeo, replete with priceless masterpieces, tapestries, furniture and paintings. The terraced gardens reach their dramatic apex with the unicorn, the Borromeo family emblem. On Isola Madre is the Borromeo bambini doll collection, as well as a number of portraits of the family. A magnificent botanical garden flows from the house with plentiful exotic trees, plants and flowers. We are looking for contributors for our Lake Country travel guide. If you are a local, a regular traveller to Lake Country or a travel professional with time to contribute and answer occasional forum questions, please contact us.